Finger position labels are color coded to correspond to the correct finger for use during typing/computer instruction. They contain both lower and upper case lettering. Excellent for young computer users or anyone wanting brighter more colorful keys. Made of high quality Lexan®, printed sub-surface for years of use. 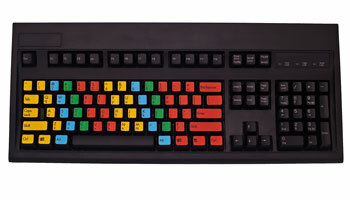 The finger position labels feature color-coded labels that show the typing student which fingers to use with each key. The labels also show the upper and lower case character for each key for the beginning student. The Finger Position labels are perfect for the beginning typing student to graphically show them the "typing zones" for each finger. After the student has mastered the basic typing skills, the black, opaque typing mask can be used to test the student's ability and to teach them to type without looking at the keyboard.